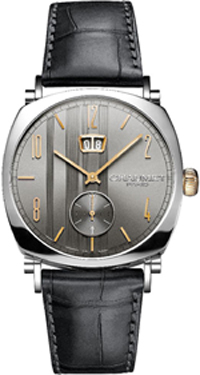 Stylish new Dandy Vintage Grande Date (Ref W11783-47V), elegant design which is designed in vintage style 50s of last century, is represented in the current 2012 a famous French jewelry house of Chaumet. Cushion new housing diameter 39 mm made of stainless steel. Crown model, which is located in the 3 o’clock position, is made of pink gold. On the front of the building is equipped with a convex sapphire crystal, which serves as a reliable protection for the silvered dial opalinovogo, decorated with vertical stripes and a radiant finish. Dial markings in the form of Arabic numerals, the central arrow, framing the aperture and time indices are covered with pink gold. Small seconds hand put to the side of the dial in the 6:00 position. Date placed in a double aperture set to 12 o’clock position. New Dandy Vintage Grande Date (Ref W11783-47V) operates on the basis of a Swiss automatic movement CP12V-VII Dubois-Depraz, made exclusively for CHAUMET. The model is supplied on an alligator strap in dark gray, fitted with a double folding clasp in stainless steel. You can buy watches from authorized company representatives CHAUMET.